We look at five states of matter on the site. Solids, liquids, gases, plasmas, and Bose-Einstein condensates (BEC) are different states of matter that have different physical properties. Solids are often hard, liquids fill containers, and gases surround us in the air. Each of these states is also known as a phase. How does matter change from one state to another? Elements and compounds can move from one state to another when specific physical conditions change. For example, when the temperature of a system goes up, the matter in the system becomes more excited and active. If enough energy is pushed into a system, a phase change may occur as the matter moves to a more active state. Let’s say you have a glass of water (H2O). 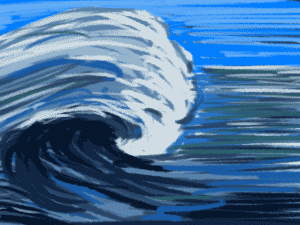 When the temperature of the water goes up, the molecules get more excited and bounce around a lot more. 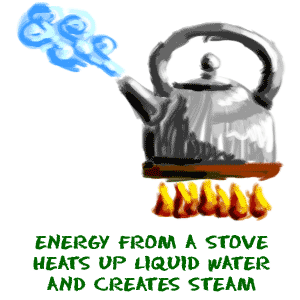 If you give a liquid water molecule enough energy, it escapes the liquid phase and becomes a gas. The extra energy allows the molecules to change states. Have you ever noticed that you can smell a turkey dinner after it starts to heat up? As the energy of the molecules inside the turkey heat up, they escape as a gas. You are able to smell the volatile compounds that are mixed in the air around you. "Phase" describes the physical state of matter. The key word to notice is "physical". Matter only moves from one phase to another by physical means. If energy is added (increasing the temperature) or if energy is taken away (freezing something), you can create a physical change. Changing the pressure of a system is another way to create a physical change. If you place a glass of liquid water on a table, it will just sit there. If you place a glass of water in a vacuum chamber and lower the pressure, you can begin to watch the water boil and the water molecules move to a gas phase. When molecules move from one phase to another they are still the same substance. There is water vapor above a pot of boiling water. That vapor (or gas) can condense and become a drop of liquid water in the cooler air. If you put that liquid drop in the freezer, it would become a solid piece of ice. No matter what physical state it was in, it was always water. Even though the physical state changed, the chemical properties were the same. On the other hand, a chemical change would build or break the chemical bonds in the water (H2O) molecules. If you added a carbon (C) atom, you would create formaldehyde (H2CO). If you added an oxygen (O) atom, you would create hydrogen peroxide (H2O2). Neither new compound is anything like the original water molecule. Generally, changes in the physical state do not lead to any chemical change in compounds. There are many liquids around you. Oceans, lakes, and rivers are good examples of liquid water (H2O). Planetary scientists are looking for other planets that have liquid water, but planets require very specific conditions to have water as we know it. 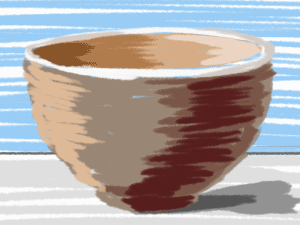 Ceramic bowls are a great example of a solid. Did you know that pieces of pottery make up many of the items found from ancient civilizations? Ceramic materials are usually made from soft clay that is heated up and then slowly cooled. The clay becomes very hard because water (H2O) is removed and the chemical bonds inside the clay change. Plasmas are highly energized gases that have lost their electrons. Stars, including the Sun, are covered in plasma. 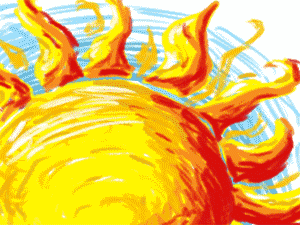 Hydrogen (H) and helium (He) ions float around the Sun with their electrons moving freely. Balloons aren’t technically gases. They are little pieces of rubber. However, the helium (He) inside the balloon is a gas. Helium is a noble gas that has a very low atomic mass. In its gaseous state, it is lighter than air. The helium atoms have a lower mass than the nitrogen (N2) and oxygen (O2) molecules that fill most of our air. 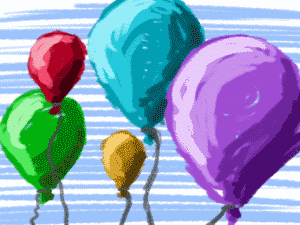 The lower mass and lightness helps balloons to float.